The RS5000 is an iconic shock absorber that's been delivering smooth and comfortable rides for over 30 years. First released in 1985, the RS5000 has proved to be an international success, outselling every other shock system offered by Rancho. The RS5000 system boasts ten-stage velocity sensitive valving allowing you to fine tune this shock to any make or model of vehicle. The striking combination of white metal body and bright red protective boot delivers stylish looks while protecting your shock system from any off-road environment you can throw at it. Inside the main shock body, the RS5000 houses a 5/8-in. (16mm) diameter piston rod and a 1 3/8-in. (35mm) diameter piston, ensuring strong and reliable performance. Rancho is confident enough of the RS5000's abilities that it comes packaged with a limited lifetime warranty, giving you the ultimate peace of mind off-road. 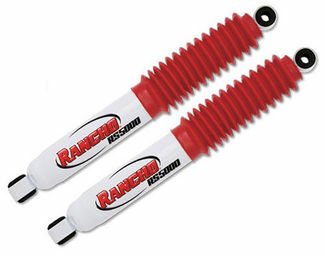 The RS5000X shock absorber is Rancho's modern spin on a classic design. This upgraded shock features a unique and proprietary rebound valving system. Using carefully crafted compression discs within the stack, the RS5000X will cleverly engage early flow of fluids, helping to reduce harsh initial impacts such as potholes. This system is housed in a 2 1/4-in (57mm) white metal body. The increased sized of the shock body allows for enhanced fluid capacity, creating a system that operates cooler than the standard RS5000 design. The RS5000X also features gas pressurization technology. Operating at 150 Psi, the twin-tubed gas pressurization minimizes oil and air mixing, while simultaneously offering a boost to the vehicles spring rate. Each 16mm shock rod now undergoes a nitro-carburization process, enhancing the overall strength and durability of the shock, while helping to combat corrosion and scuffing. Finally, the RS5000X boasts double-welded loops on high-stress areas such as vehicle mounting points. This adds to the overall sturdy and durable design of the RS5000X. 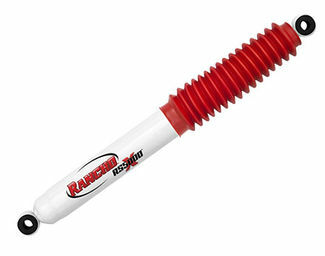 This shock an excellent choice for anyone who wants their shocks to pack the latest in modern technology.